Girl, I’ve so been there. I feel your pain. You know that cute vision you had before you lived together where you’d fall asleep in each other’s arms and wake up the next morning all huggy and snuggy? Yeah, that was what I pictured before I got married. It didn’t take long for the loud reality to hit me up side the head. I remember one night not too long after we got married. I was lying there next to him snoring away and I thought to myself, I’m never going to sleep like a normal person. Heck, back then I had serious doubts I was ever going to sleep again period. Those early days in our marriage were shaky because of his snoring. It was seriously affecting our relationship. Not only was his snoring leaving me exhausted, the fact that he didn’t think it wasn’t a big deal made it all the more aggravating. Dealing with a snorer who’s in denial is tough, but don’t give up. You can get through this! 1 What Do you Do When your Spouse Won’t Do Anything About Their Snoring? 4 How Do you Sleep When your Partner is Snoring? 5 Are There Natural Home Remedies for Snoring that Might Work? What Do you Do When your Spouse Won’t Do Anything About Their Snoring? Sometimes you have to be the bad guy and force the issue. I think the only thing more aggravating than sleeping with a snorer is sleeping with a snorer who doesn’t think their snoring is a problem. If they even admit they snore at all. But it’s important to give them some tough love here and be brutally honest. If not for your sake, then for theirs. 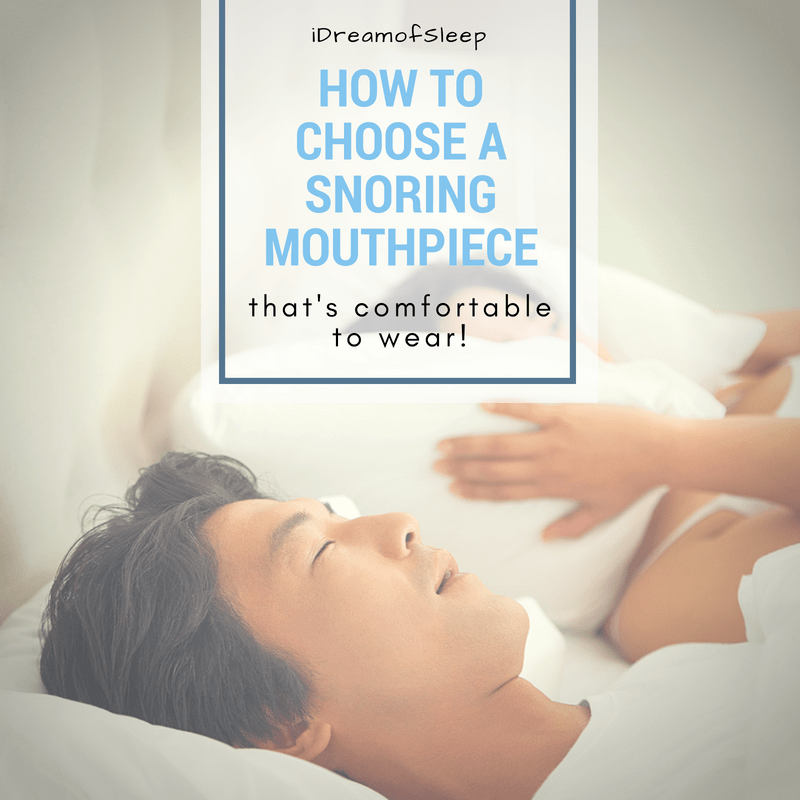 One of the most important and serious reasons why you should push him into doing something about his snoring is the possibility of it being sleep apnea. There’s a whole host of health conditions that are caused or made worse by sleep apnea, such as diabetes, elevated LDL or “bad” cholesterol levels, heart disease and even a stroke. It’s a real condition that kills, and it’s important to see a doctor to rule sleep apnea out. According to sleep.org, about half of snorers have sleep apnea. 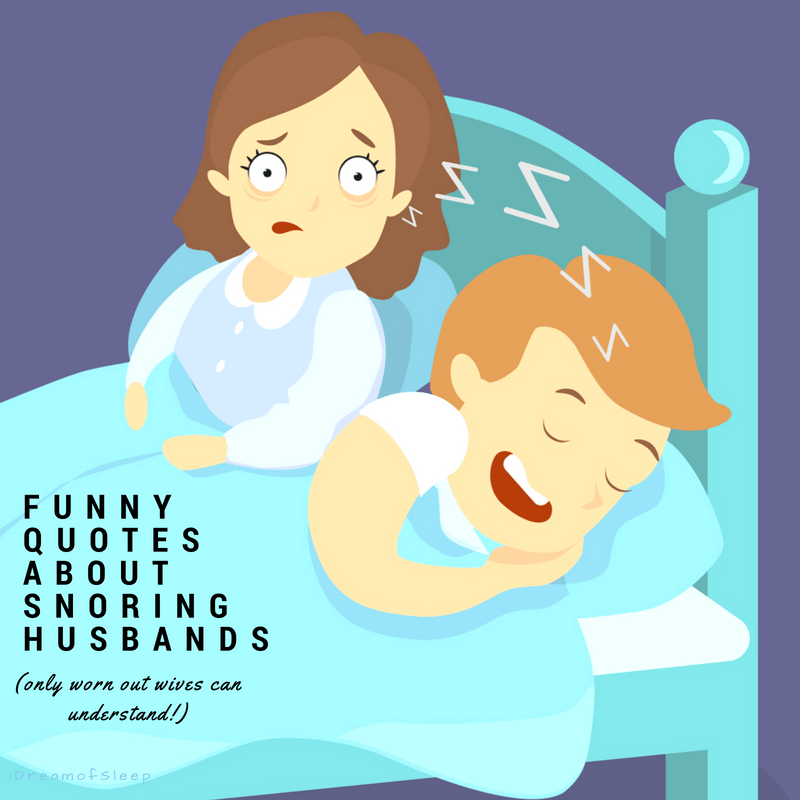 So just because your husband snores, doesn’t mean it’s dangerous. But there’s a 50/50 shot of it being life-threatening and that’s not something I’m willing to gamble with. On the relationship side, a snoring spouse can ruin a marriage. Seriously. If you’re not sleeping, you’re cranky and irritable on a pretty much constant basis. After a while, bitterness can set in, especially if he thinks his snoring’s a non-issue. Couples have actually divorced citing snoring as a reason, so it’s important to protect your marriage and work the snoring situation out. You’re probably thinking, that’s good and all, but how am I supposed to be the husband whisperer and get through to him? Okay, this is experience talking here. NEVER talk to your husband about his snoring either right before bed or when you’re already in bed. He’s going to take it personally and see it as an attack on him. In the early days of our marriage, I would just get up when I couldn’t take his snoring anymore and go to the other room. Well, the next morning I’d get the silent treatment. I was like, what the heck? I didn’t leave because I was mad, I left because your snoring was keeping me awake. I finally just said something one day when we were just enjoying spending time together. I said, look, it’s not that I don’t want to sleep in the same bed with you, it’s just that I can’t take the snoring. It keeps me up all night and it really makes it hard for me to do my job during the day. He understood then that I didn’t think HE was the problem, it was his snoring that was the issue. His whole attitude changed after that. He actually bought me some sleep headphones to wear at night. He even would even be proactive and sleep in the spare room if he was really tired and knew he’d be loud that night. Don’t have the “snore talk” once you’re already in bed. You’re just setting yourself up for failure here. If you talk to him now, he’ll probably just think you’re being a nag or making a big deal out of nothing. Talk to him when you’re both in a good mood. For example, if you try talking to him when he’s kept you up all night, you’re going to be crabby and he’s going to be defensive. Don’t yell or be accusatory when you bring his snoring up. Again, it’s going to put him on the defensive and he’s just going to shut you out and not listen to you. Explain how his snoring is affecting you physically. Tell him (in a nice way) that you feel exhausted from a lack of sleep. If a lack of sleep causes you migraines, tell him. If it causes you to not be able to perform at work, tell him. Most men would never want to willingly cause their wives problems, and saying how it’s negatively affecting you can make him realize it’s a problem rather than just being an aggravation. Getting most husbands to see a doctor about any condition is like pulling teeth. Trying to get them to see a doctor about snoring can seem like it’s impossible. I’m not going to tell you this is easy, or even something you can make happen, but it’s important to do all you can to get him to a doctor. Here’s a couple of suggestions to talk to your husband about getting tested for sleep apnea. Explain to him the dangers of sleep apnea. Your husband may not know snoring is a symptom of a life-threatening condition. Show him a list of sleep apnea facts so he can learn what’s true and what a myth. Try an at home test first. If he flat refuses to see a doctor because he thinks he’s okay, having him do an at home test might make him realize there’s a problem. You can actually buy at home sleep apnea kits now. And while it won’t replace seeing a doctor, it will give him proof there’s an issue. How Do you Sleep When your Partner is Snoring? Sometimes no matter how much you talk to him, you’re not going to get him to realize snoring is a problem and to see a doctor about it. Your life has to go on because you have to get the sleep you need. So how can you sleep in peace when your husband snores like a freight train and won’t do anything about it? 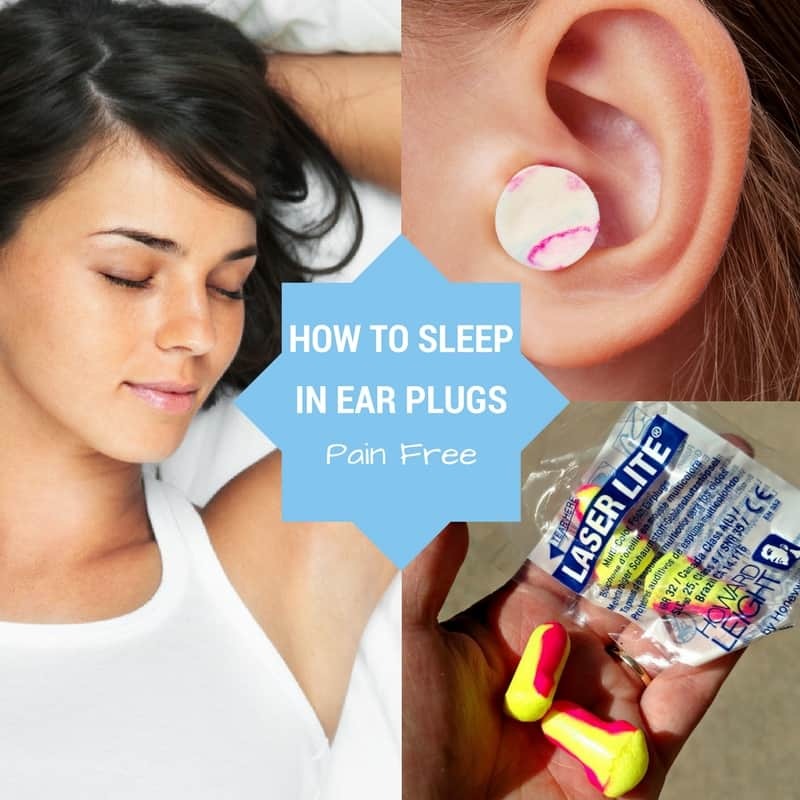 Wear snore proof earplugs. I use Howard Leight’s individually packaged earplugs. I’ve found them to be the best earplugs for snoring spouses because their decibel rating is 32, so they can block loud snoring almost completely. Wear a soft sleeping headband, too. No matter how good your earplugs are, you’re still going to hear some snoring through your soft tissues. 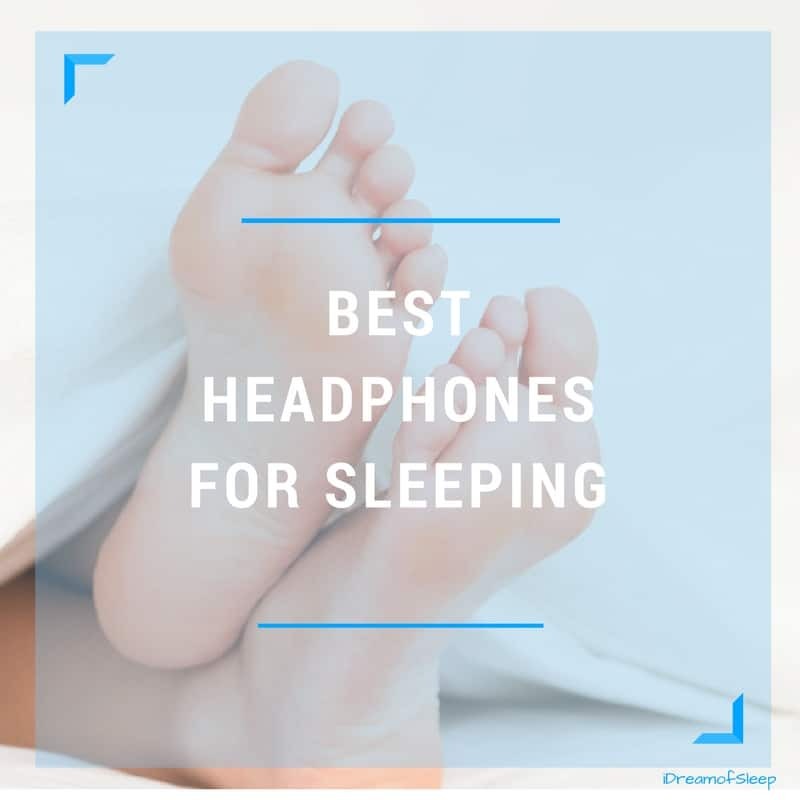 I wear bluetooth SleepPhones and play white noise from an app on my phone. They literally changed my life! Sleep in separate rooms. This requires a lot of communication to make sure he’s okay with it, but sometimes you’ve got to do what you’ve got to do. My husband finally realized we both get better quality sleep when we don’t sleep together. 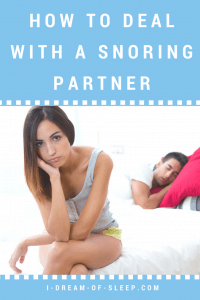 Snoring impacts your relationship negatively, so learning how to sleep with a snorer is crucial. 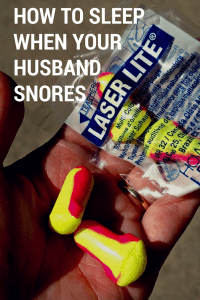 If you’d like to learn more tricks I’ve used to sleep with my snoring husband, you might like How to Sleep through Snoring: Genius Hacks from a Worn Out Wife. Are There Natural Home Remedies for Snoring that Might Work? If your husband isn’t ready to see a doctor yet, he might be willing to try a home remedy for snoring. They may or may not work, depending on what’s causing his snoring, but it’s worth giving it a shot if he’s willing to try them. Prop the bed up at least four inches. This keeps the tongue from slipping into the back of the throat. Put a couple of bricks under the head of the bed or sleep on a wedge pillow. Run a humidifier at night. If nasal congestion is causing the snoring, a humidifier can help open up nasal passageways. Use a neti pot. This is another good one to try if his snoring is caused by congestion or allergies. Diffuse essential oils at night. Aromatherapy oils like peppermint, eucalyptus, and ravintsara open the airways. Add 6-10 drops of oil to a bedside diffuser and let it run during the night. Drink a warm drink sweetened with honey. Honey lubricates and helps reduce swelling in the throat and keep the airways open. Mix a tablespoon of honey in a cup of warm milk and drink up before bed. Honey also is a great natural sleep aid, which is a happy little bonus! When you’re ready to branch out, you can try different honey sleep drinks to help snoring. Remember, natural snoring remedies shouldn’t take the place of being treated by a doctor. 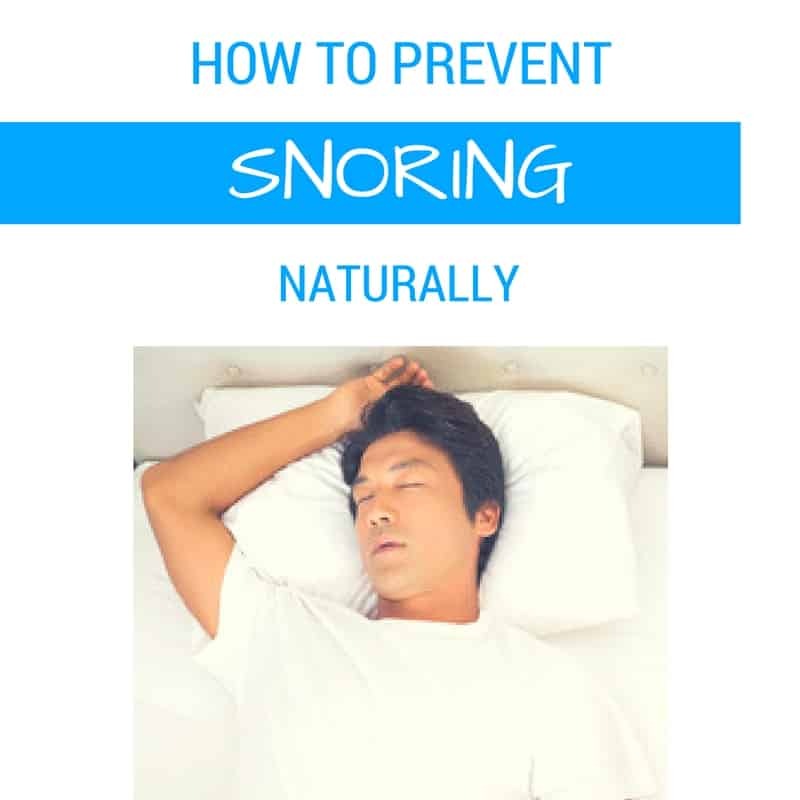 Natural remedies are a good first step to addressing a snoring problem, and something that’s helpful after sleep apnea has been ruled out. When your husband snores and won’t do anything about it, it really puts a strain on your marriage. Sleeping next to a bandsaw shoots up your aggravation levels and blood pressure at night and leaves you feeling exhausted during the day. Add in the constant worry of sleep apnea weighing in the back of your mind and it just escalates the tension between you. Do your best to get your husband to see a doctor about his snoring. If he won’t go and won’t take steps to doing something about his snoring, pray for him and then you take care of you. Don’t live your life exhausted. 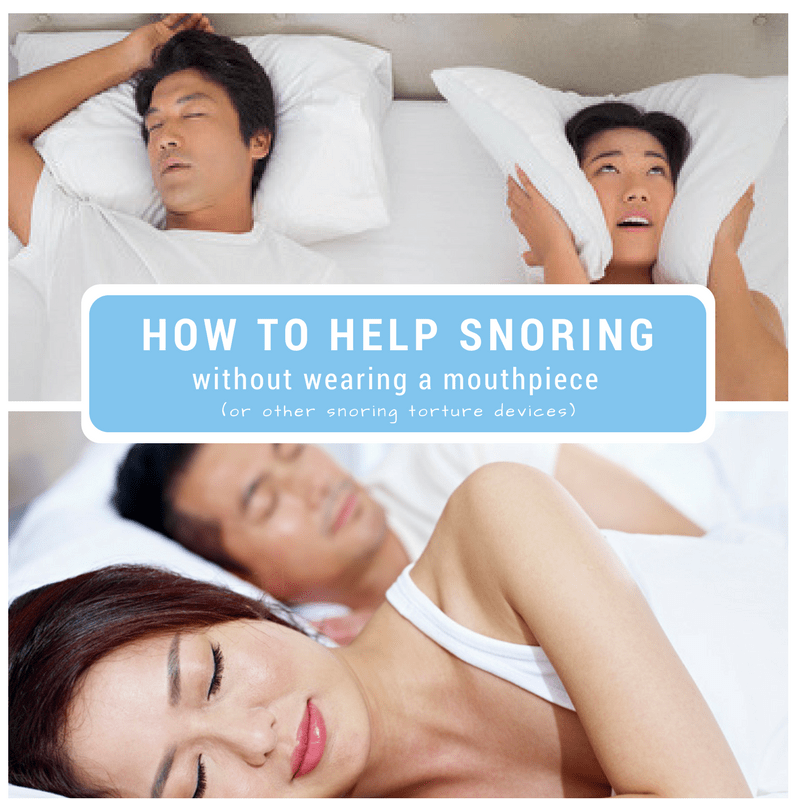 Learn how to sleep next to your snoring spouse or move to another room. 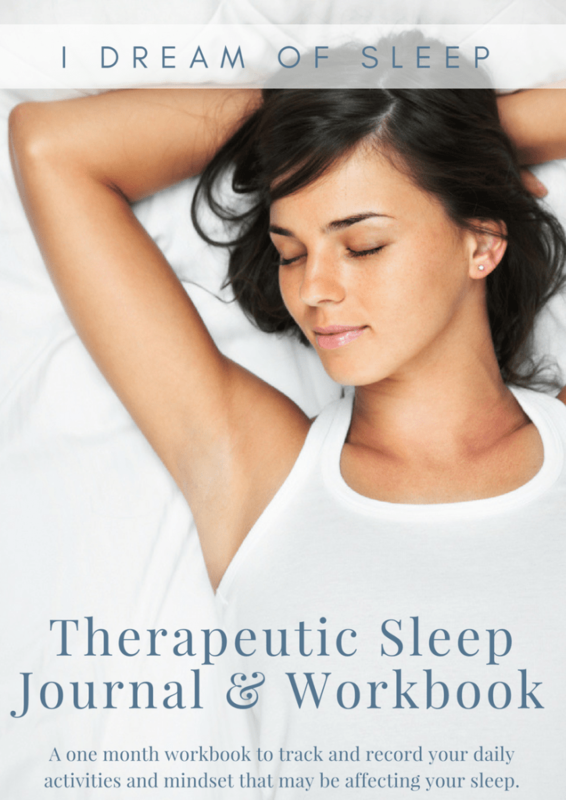 Whatever you need to do, do it to get the sleep you need so you can be well-rested and function on a daily basis. My husband is suffering from sleep apnea from a long time. I have told him to stop smoking and drinking alcohol. But he has not stopped yet. At night he is snoring loudly. I don’t know how to help me. He has the masks for side sleepers, but here also he is irregular in using the mask. I am also looking for some natural remedies to cure the sleep apnea permanently. Hi there! I’m so sorry your husband isn’t really realizing how serious sleep apnea can be. Unfortunately, he’s a grown man, and if he chooses not to do what he needs to for his health, there’s not really much you can do. 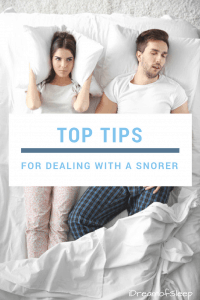 My advice would be to do what you can to get sleep, and if it involves sleeping in another room, gently explain to your husband how his snoring is keeping you awake and that you need rest. Keep reminding him what he should be doing to treat his sleep apnea. As for natural remedies for sleep apnea, I’m not sure there are any. I’m not a doctor, and this is something that should be handled by your physician. Hope you work things out.